The Poor Man's Covered Call substitutes the 'owning the stock' part and replaces it with you purchasing a LEAP for protection ... yet still writing near term covered calls. I've done a Youtube video learning series that explains this strategy which I suggest you watch if you're new to this strategy but want to try. Click below and be sure to 'Subscribe' to my Youtube channel because I will be doing video's throughout the year on this strategy and we talk about it 'Straight talk style' so we understand it. 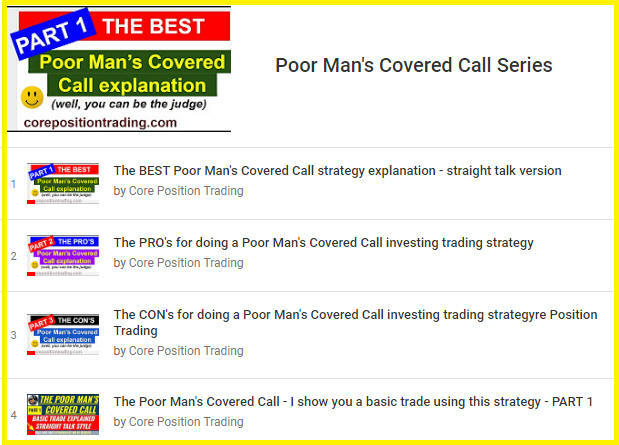 Also, be sure to download your FREE copy of the Poor Man's Covered Call Tracker Spreadsheet IF you're thinking of this strategy to track all your trades.. its FREE and has NO HOOKS ... I offer it up for free to Up Our Game! The Poor Man's Covered Call Tracker Spreadsheet is available for FREE!